The socket sides of the block express the data needed for its function. 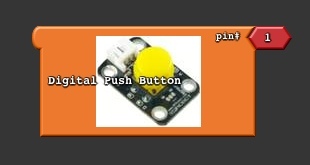 In this case, the “pin” the button is attached. The image is located under src/main/resources and the relative path name to this directory should be used. all text in the attributes “initlabel” or “label” will get run through a localization process and the localized text are stored in “src/main/resources/com/ardublock/block/ardublock.properties” for English. Translation into other language is managed at the ArduBlock Translation. Add the block to a Drawer. Can you quickly outline what edit-time / compile-time environment needs to be set up? On what type hosts? Sorry, but I do not really understand the expected Tool Chain..
I’ve integrated the src code of ardublocks into eclipse and i’ve tried to edit and add more features to tht and while execution m getting “Error: Could not find or load main class com.ardublock.Main” and after loading the main method also m getting the same error……Plzz help me!! !